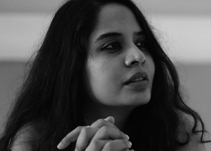 An alumna of Iowa’s International Writing Program, and Charles Wallace Writer’s fellowship, Rochelle Potkar was the winner of the 2016 Open Road Review contest for The leaves of the deodar. Her poem The girl from Lal Bazaar was shortlisted for the Gregory O' Donoghue International Poetry Prize, 2018. Her poem Place won an honorable mention at Asian Cha’s Auditory Cortex. Her poem Skirt was made into a poetry film by Philippa Collie Cousins for the Visible Poetry Project. She is the author of The Arithmetic of Breasts and other stories and Four Degrees of Separation, and the co-editor of the Joao Roque Literary Journal (with chief editor Selma Carvalho) that promotes literature around Goa. She is also editor of the Goan-Irish anthology, Goa: a garland of poems with transcreations by Gabriel Rosenstock; and of the collected works of Joseph Furtado - Golden Goa! and Songs in Exile, due soon. Her story Chit Mahal (The Enclave) appears in The Best of Asian Short Stories, Kitaab International. Paper Asylum by Copper Coin Publishing is her latest book.